Gabriel (Hebrew: גַּבְרִיאֵל, or Jibril; Arabic: جبريل; "Hero of God") is a prominent angel in the Abrahamic religions, who serves God in various capacities, and is especially mentioned in scripture as God's messenger. Esteemed as one of the archangels in Judaism, Eastern Orthodoxy and Roman Catholicism, Gabriel was also called the chief angel in Islam, who revealed the Qur'an to Prophet Muhammad, thereby called the "angel of truth." Gabriel is one of the few religious figures who are commonly revered in more than one religious tradition. The angel Gabriel is first mentioned in the Book of Daniel in the Hebrew Bible (Dan. 8:16; 9:21). In the New Testament he appears to the Virgin Mary in the Annunciation and to Zechariah (Luke 1:19, 26, 27). In Islam he is described as one of God's chief messengers, who brings the Holy Qur'an to Muhammad. He is discussed in Muslim Hadith and in the Jewish Talmud. Gabriel is more than a simple angel who watches over human beings; he is one of the chief archangels who announce God's will to the central figures of faith: to Moses, Jesus, and Muhammad. He is thus a symbol of God's providential guidance to each of the Abrahamic faiths—Judaism, Christianity, and Islam—and his appearances to their founders demonstrate that each religion has been rightly guided by God. Gabriel thus offers great potential as a symbol of religious harmony and unity. And it came to pass, when I, even I Daniel, had seen the vision, that I sought to understand it; and, behold, there stood before me as the appearance of a man. And I heard the voice of a man between the banks of Ulai, who called, and said: "Gabriel, make this man to understand the vision." So he came near where I stood; and when he came, I was terrified, and fell upon my face; but he said to me: "Understand, son of man; for the vision belongs to the time of the end" (Dan. 8:15, 8:17). And while I was speaking, and praying, and confessing my sin and the sin of my people Israel, and presenting my supplication before the Lord my God for the holy mountain of my God; and while I was speaking in prayer, the man Gabriel, whom I had seen in the vision at the beginning, being caused to fly swiftly, approached close to me about the time of the evening offering. And he made me understand, and talked with me, and said: "Daniel, I have now come to make you skillful of understanding. Seventy weeks are decreed upon your people and upon your holy city, to finish the transgression, and to make an end of sin, and to forgive iniquity, and to bring in everlasting righteousness, and to seal vision and prophet, and to anoint the most holy place" (Dan. 9:20, 9:24). Gabriel tells Daniel about the mysterious "Seventy weeks" (shavu-im shivim) that seem to indicate the end of the Babylonian captivity which lasted 70 years, whereupon Cyrus the Great allowed the return to Zion and the rebuilding of the Temple by the Jews in his empire. In the Talmud, Gabriel appears as the destroyer of the hosts of Sennacherib "with a sharpened scythe which had been ready since Creation" (Sanhedrin 95b). The Archangel is also attributed as the one who showed Joseph the way, the one who prevented Queen Vashti from appearing naked before King Ahasverus and his guests, and as one of the angels who buried Moses. In Talmud Yoma 79a, however, it is stated that Gabriel once fell into disgrace "for not obeying a command exactly as given, and remained for a while outside the heavenly Curtain." During this 21 day period, the guardian angel of Persia, Dobiel, acted as Gabriel's proxy. Gabriel is also, according to Jewish mythology, the voice that told Noah to gather the animals before the great flood, the invisible force that prevented Abraham from slaying Isaac, the invisible force that wrestled with Jacob, and the voice of the burning bush. Gabriel delivering the Annunciation. Painting by El Greco (1575). In the New Testament, Gabriel is the angel who comes with the Holy Spirit to Zechariah and reveals that John the Baptist will be born to Elizabeth, and who visits Mary to reveal that she will give birth to Jesus. According to later legend, he is the unidentified angel in the Book of Revelation who blows the horn announcing the Judgment Day. To Catholics, he is St. Gabriel the Archangel, the patron saint of communications workers, and his feast day is September 29. 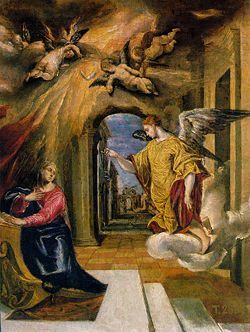 Gabriel's visit to Mary in the Gospel of Luke is often called "The Annunciation," (Luke 1:26), an event that is celebrated on March 25. It is also commemorated as the "First Joyful Mystery" each time the rosary is prayed. In Latter-day Saint theology, Gabriel lived a mortal life as the patriarch Noah. Gabriel and Noah are regarded as the same person, but Gabriel alone is regarded as the immortal resurrected being, or angel. As such, all of Noah's children are considered to be Gabriel's earthly children. In Islam, Gabriel is known by the Arabic name جبرئيل,جبرئيل,or جبريل (pronounced Jibreel). For Muslims, Gabriel is the angel who revealed the Qur'an to Prophet Muhammad, verse by verse, and thus is considered the most prominent angel, as well as the spirit of truth. He is described by the hadith as having six hundred wings. She placed a screen (to screen herself) from them; then We sent to her Our Ruh [angel Jibrael (Gabriel)], and he appeared before her in the form of a man in all respects. She said: “Verily! I seek refuge with the Most Beneficent (Allah) from you, if you do fear Allah.” (The angel) said: “I am only a Messenger from your Lord, (to announce) to you the gift of a righteous son.” She said: “How can I have a son, when no man has touched me, nor am I unchaste?” He said: “So (it will be), your Lord said: 'That is easy for Me (Allah): And (We wish) to appoint him as a sign to mankind and a mercy from Us (Allah), and it is a matter (already) decreed, (by Allah)’" (Qur’an 19:17-21). In Islam, Gabriel accompanied Muhammad in his ascension to the heavens, Mi'raj. Muslims also believe that the angel Jibreel descends to Earth on the night of Lailat-ul-Qadr ("The Night of Power"), a night in the last ten days of the holy month of Ramadan in the Islamic calendar. Gabriel finds mention in the writings of the Bahá'í Faith, most notably in Bahá'u'lláh's metaphysical work The Seven Valleys and the Four Valleys. In his epic poem Paradise Lost, John Milton made Gabriel chief of the angelic guards placed over Paradise. In the epic poem The Song of Roland, Gabriel instructs Frankish King Charles Martel, to deliver the sword Durendal to Roland. Gabriel also bears Roland's soul to heaven. ↑ A Hebrew-English Bible, Daniel Chapter 8. Retrieved July 16, 2007. ↑ A Hebrew-English Bible, Daniel Chapter 9. Retrieved July 16, 2007. ↑ USC-MSA Compendium of Muslim Texts, Translation of Sahih Bukhari , Book 8: Prayers (Salat). Retrieved July 16, 2007. Catholic Encyclopedia. St. Gabriel the Archangel. Christian Art. 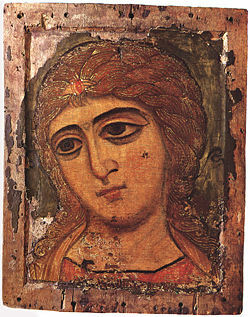 Icons of the Archangel Gabriel. Finney, Dee. Archangels and Guardian Angels. This page was last modified on 16 May 2017, at 19:57.